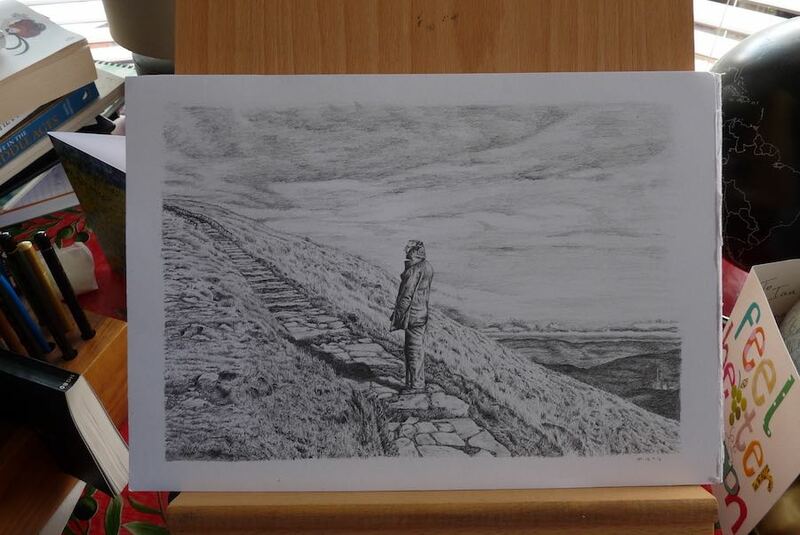 Mam Tor – the Shivering Mountain (sketch) – Pens! Paper! Pencils! Mam Tor is a hill in the beautiful Peak District of Derbyshire. It’s known as the Shivering Mountain because it’s made up of very unstable layers of shale, which frequently slip. In fact these landslips have created in lots of little baby hills below: Mam Tor means Mother Hill. I started drawing this at the beginning of April and then I became ill. Although the trigger was a virus of some unidentifiable kind, I’d been trying to do too much for too long and it completely wiped me out. For five or six weeks I couldn’t do a thing and only recently have I been starting to get back to normal. There’s still a way to go but I’ve finally been able to finish this picture. You may think you’re invincible and can do it all but take it from me: you can’t. It will catch up with you eventually and, really, it’s just arrogant to think it won’t. Good is coming from all this and I’ll be a much healthier and happier person at the end of it but learn from my mistakes! Look after yourself and be sensible about what you try to do. You owe it to yourself and to those who love you. Glad you’re pulling through, Ian! Sounds horrid. Hope you are all better now.